Southerland says she dreams about buying a home in Bolton Hill, where it's quiet and culturally diverse. Devan Southerland and her son, Liam, stroll through the historic Bolton Hill neighborhood in Baltimore, where Southerland wants to buy a home. Southerland is studying for a master's degree and currently works as a legal assistant. She wants to purchase a home in Baltimore City, where she was born and raised. A recent study found that a large wealth gap continues to exist in Baltimore. Experts say it was exacerbated by the city's practice of redlining where neighborhoods were systematically devalued based on race. Southerland and Liam visit an open house in her neighborhood. A balloon advertises an open house on a street in McElderry Park in Baltimore. At times, not being a homeowner weighs on her. "Oh, I feel like I should have more by now, like I've got to step it up. This is crazy, why am I not further?" Owning a home is widely believed to be the best way for working and middle class Americans to build wealth. 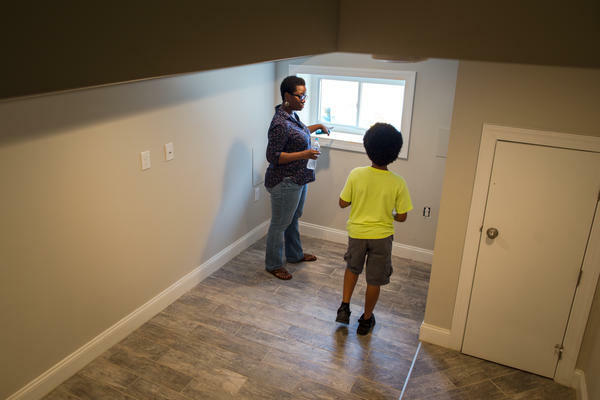 And for many African-Americans, the dream of homeownership remains an elusive one. A recent report by Harvard University's Joint Center for Housing Studies found that 43 percent of black adults in the U.S. owned homes in 2017. Contrast that to white homeownership rates, which were measured at 72 percent. Researchers found that between 1987 and 2017, homeownership rates increased for Asian-Americans, Hispanics and whites. But African-Americans in that timespan lost ground, falling nearly 3 percentage points below their 1987 levels. "Taken together, these trends mean that while the Hispanic-white and Asian-white homeownership gaps have narrowed somewhat over the past three decades, the black-white gap has widened substantially," according to the report. In the runup to the housing bubble a decade ago, black Americans were making strides getting into the ranks of homeownership. No longer, says Alanna McCargo, vice president of housing policy at the Urban Institute. 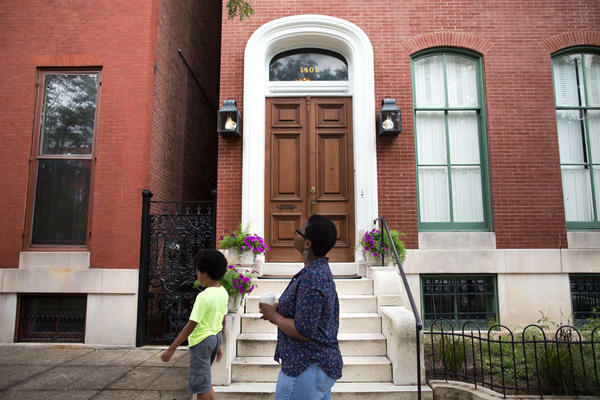 "There was a slight uptick in black homeownership going into those years," McCargo said. But since then, she said, all sorts of gains that had been made have been lost. Earlier this year, the Urban Institute charted the disparities between the rates of white and black homeownership. So just how bad has it become in the U.S.? "To put it into context, if you think about the last 50 years when the Fair Housing Act was passed, the black homeownership rate today is just the same as it was in 1968," McCargo says. When broken down by city, some places do worse than others. Minneapolis, for instance, ranks the worst in the country with a homeownership gap of 50 percent. Albany, N.Y., and Salisbury, Md., are not far behind. Charleston, S.C., and Austin, Texas, are around 20 percent. But Baltimore — a city where two-thirds of the population is African-American — is right smack in the middle. The city's 31 percent white-to-black homeownership gap mirrors the national average. "It's definitely not a surprise," says Lawrence Brown, a professor in the School of Community Health and Policy at Morgan State University in Baltimore. Brown points to a 2017 study by the Washington-based think tank Prosperity Now, formerly known as Corporation for Enterprise Development. The unemployment rate is three times higher than whites. Two-thirds do not possess three months' worth of savings to cover expenses in the event of a job loss. Median income rates were half that of whites in the city. Brown adds that present-day underinvestment in black neighborhoods echoes what happened in the city decades ago: the practice of redlining neighborhoods means certain areas are systematically devalued and denied financial services because of their racial makeup. "People in black communities, in these redlined areas, have not been able to accumulate the wealth and resources oftentimes to be able to purchase those homes," Brown says. "And then, oftentimes when they do, they get hit with the predatory loan. So they're redlined on the front end, subprimed on the back end." In 2012, Wells Fargo reached a landmark $175 million settlement with the U.S. Department of Justice over accusations the bank steered black and Latino customers into high-cost loans. The settlement was sparked by a lawsuit filed by the city of Baltimore over violations of fair lending laws. Housing experts say another problem is that housing inventory in the city, like in many parts of the country, is dwindling. "Inventory is really at an all-time low," says JoAnne Poole, an associate broker with Berkshire Hathaway with more than 30 years of experience in the Baltimore housing market. "A healthy market is six, seven months of inventory. When you start to get into the two, three months' worth of inventory, that's really not a lot." She also points out that Baltimore City's property taxes are among the highest in Maryland. That may explain why home prices in the city are on the rise. According to one analysis, June median sales prices in Baltimore City rose nearly 4 percent from June 2017 to $170,000. McCargo, the housing expert from the Urban Institute, says closing the gap of homeownership has to be addressed on two fronts: "The black homeownership problem is not just about blacks being able to purchase homes going forward, it's equally about blacks who own today keeping their ownership and being able to transfer and build equity and advance their overall wealth picture." 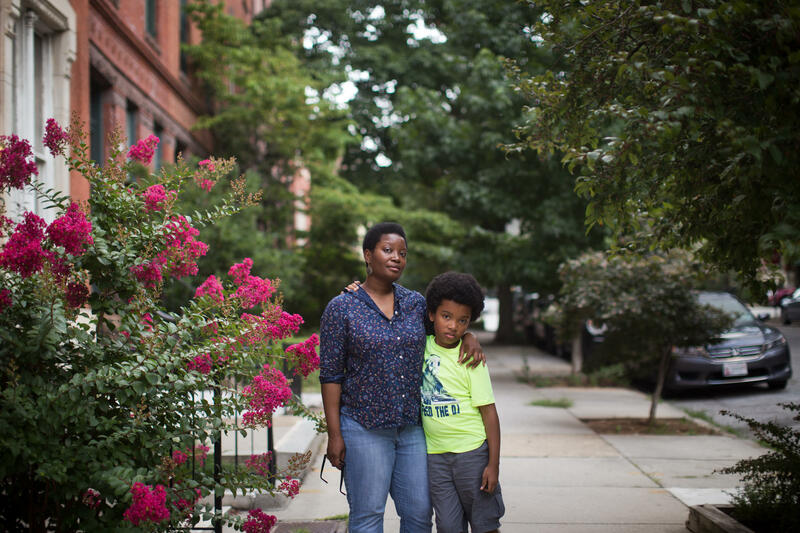 For many African-Americans, the dream of home ownership is still elusive. A recent report by Harvard University found that 43 percent of blacks in the U.S. own homes while more than 70 percent of whites do. That gap has widened over the past 30 years. NPR's Brakkton Booker reports from Baltimore as part of our series on the nations new housing crisis. BRAKKTON BOOKER, BYLINE: Devan Southerland was born and raised in Baltimore. I meet her in one of the city's most desirable neighborhoods. It's known for historic, tucked away parks and 19th century architecture. DEVAN SOUTHERLAND: Bolton Hill is an awesome mixed community. It's just a great, quiet, kept-away spot. It's one that I appreciate and I enjoy. BOOKER: This is one of her dream areas. Average home prices go for about $380,000. Southerland is a longtime renter and lives a few neighborhoods over. At times, the 39-year-old gets frustrated that she still does not own a home. SOUTHERLAND: Oh, I feel like I should have more by now. Like, I got to step it up. This is crazy. Why am I not further? BOOKER: Southerland is juggling a lot. As a legal assistant, she makes around $25,000 a year. She's raising a 10-year-old son, working on her master's degree in human services and has student loans. She's saving what she can and hopes to one day purchase here because she says Baltimore needs more black homeowners. SOUTHERLAND: For me, I just want to be smart about it because I know that a lot of black people suffered during the whole housing crisis and the whole subprime lending issue that happened a few years ago. BOOKER: In the run-up to the housing bubble a decade ago, black Americans were making strides getting into the ranks of homeownership - no longer, says Alanna McCargo, who studies housing trends. ALANNA MCCARGO: There was a slight uptick in black homeownership going into those years. And since, all sort of gains that have been made we've seen have all been lost at a national level. BOOKER: McCargo is the vice president of housing policy at the Urban Institute. Earlier this year, her organization mapped the disparities between the rates of white and black homeownership. So just how bad is it in the U.S.? MCCARGO: Just to put it into context. If you think about the last 50 years when the Fair Housing Act was passed, the black homeownership rate today is just the same as it was in 1968. BOOKER: When broken down by city, McCargo says some places do worse than others. Cities like Minneapolis or Albany, N.Y., have nearly 50 percentage points between white and black home ownership. Charleston, S.C., and Austin, Texas, are around 20 percentage points. But Baltimore, a city where two-thirds of the population is African-American, is right smack in the middle. The city's 31 percentage point gap mirrors the national average. LAWRENCE BROWN: No, it's definitely not a surprise. BOOKER: Lawrence Brown is a professor in the School of Community Health and Policy at Morgan State University in Baltimore. Brown points to a study from 2017 that found, among other things, a large wealth gap persists in Baltimore City. BROWN: There's really almost a twofold gap between black Baltimoreans and white Baltimoreans. That definitely contributes to a disparity in homeownership. BOOKER: Despite having a majority black city council and five out of the last six mayors being African-American, Brown says the city in many ways remains segregated. He adds, present-day underinvestment in black neighborhoods echoes what happened in the city decades ago, the practice of redlining where neighborhoods are systematically devalued and denied financial services because of race. BROWN: People in black communities in these redlined areas have not been able to accumulate the wealth and resources oftentimes to be able to purchase those homes. And then oftentimes when they do, they get hit with a predatory loan. So they're redlined on the front end, subprimed on the back end. BOOKER: Experts say Baltimore's housing inventory is at its lowest point in more than a decade. That's just like the rest of the country. It may be why home prices are on the rise. Alanna McCargo, the housing expert from the Urban Institute, says closing the gap of home ownership has to be addressed on two fronts. MCCARGO: The black homeownership problem is not just about blacks being able to purchase homes going forward. BOOKER: She says it's equally important for blacks who own homes to stay in those homes. Rising tax rates and foreclosures are still a threat, but home ownership is the best way to transfer wealth to future generations. 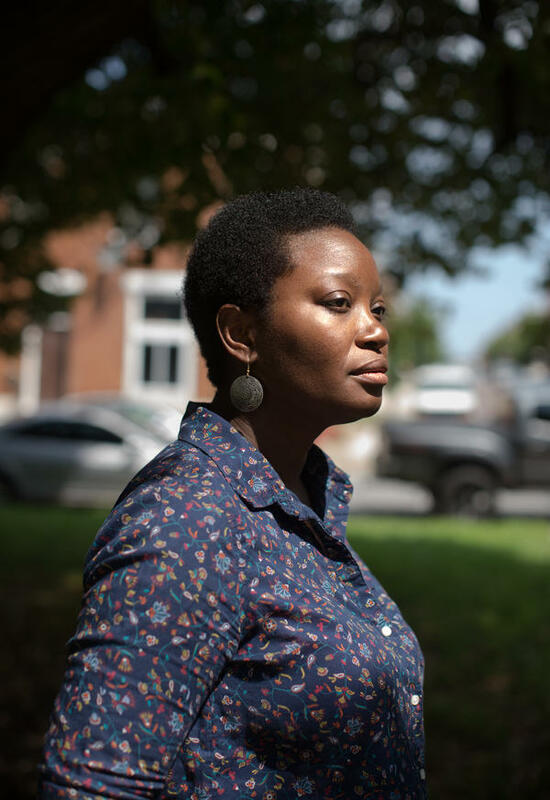 Brakkton Booker, NPR News, Baltimore. Transcript provided by NPR, Copyright NPR.